The average temperature in the south west of England is likely to be almost four degrees higher within 40 years, according to a study by the Met Office. Figures produced by the organisation predict that the region will be the hottest place in Britain - leading to drier summers and wetter winters. The knock-on effect could see citrus fruits grown outdoors and the sea at Newlyn rising by 40cm (16in). 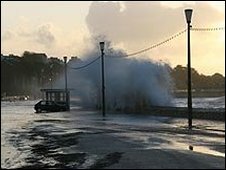 Rising seas could mean spring tides topping many harbour walls. In announcing the figures, the government has called on local authorities and other organisations to make plans for the serious consequences of climate change. As well as councils having to consider adaptations when making planning decisions, all major government investments will also have to take into account the risks from climate change. Meanwhile, a new report from the Environment Agency has said that investment in the building and maintaining of flood defences would need to almost double to counter the effects of climate change and keep the current levels of protection over the next 25 years. It said that 65,369 properties in Devon and Cornwall were currently at risk of flooding from rivers and the sea, with 29,577 at "significant risk". Many of these benefit from existing flood defence schemes. The agency said that, since 2002, £357m had been spent in the South West (including Devon, Cornwall, Somerset, Dorset, Wiltshire and South Gloucestershire) on flood risk management, including £44m in 2009/10. The regional director for the agency in the south west, Richard Cresswell, said: "The latest UK climate change data shows that the risk of flooding and coastal erosion will continue to increase in future due to rising sea levels and more frequent and heavy storms. "There are important decisions for us all to take about how to manage these risks to protect people and businesses."